ROSAHL was developed for dehumidifying (air drying) steady-state cabinets and enclosures up to 4m³ or 140 cu ft. Steady-state means the enclosure should be sealed to avoid the ingress of moisture under normal operation-in the same ways as a domestic refrigerator. It is understood that the cabinet will be opened from time to time to rearrange items but the expectation is it will be closed most of the time. For enclosures larger than 4m³ multiple Rosahl membranes are used. The precise drying time will depend on a number of variables such as starting and target humidity, air temperature, volume, leakage and so on. The following membrane selection tables have been prepared to give users an indication of drying times. We recommend you undertake your own tests. If you are interested in scientific models for estimating drying times use the contact us section to obtain the relevant links. 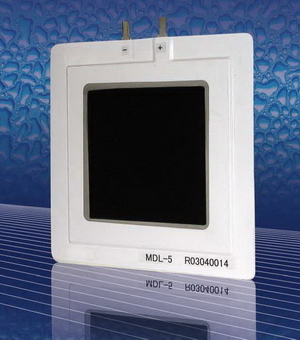 For different enclosure sizes, we recommend different models or Rosahl. If the initial drying time is not critical; the enclosure remains closed for most time, or you have a lower starting humidity, it is often possible to use a smaller membrane. It is also important to consider the volume of air inside the enclosure rather than the external dimension. 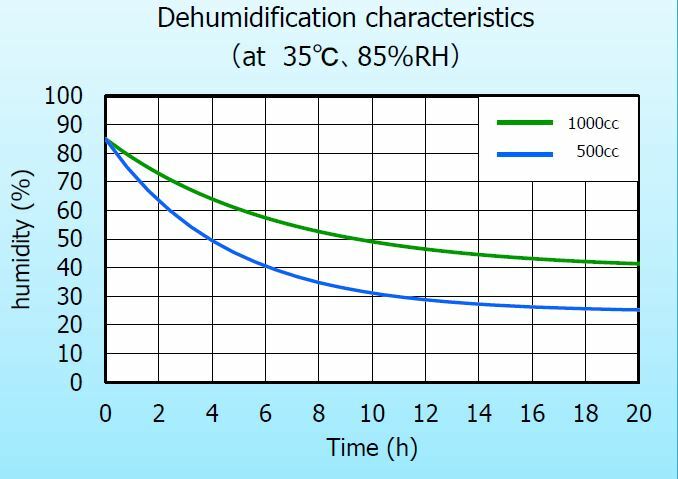 For example, if your enclosure is 50% full by volume of non-porous material, then the space to be dehumidified will be reduce by a similar amount. Rosahl has a half-life of about five years when operated 24/7 at an average operating temperature of 18°C. This means that a membrane that has operated for five years has 50% of the capacity of a new membrane. It is recommended that a larger membrane is selected for the application to give a longer effective operating life. The half-life is reduced at average annual operating temperatures above 18°C. It is extended at lower average annual operating temperatures and when operating for shorter periods of time. When the membrane is unpowered or in storage, the operating life is not affected. 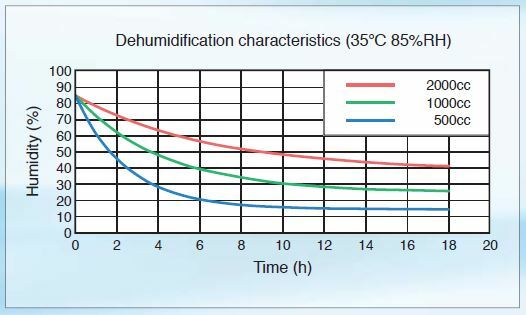 ROSAHL’s dehumidifying capacity (cabinet internal humidity) is determined from the volume of air in the cabinet and its humidity. From the table below, select a suitable model for the volume and target humidity. For example, if your cabinet has a volume of 0.5m³ and your target humidity is 50% then select the M-5J1R or MDL-5 membrane. This table is based on an ambient humidity of 90%, but also gives selection information for ambient not exceeding 70% RH. 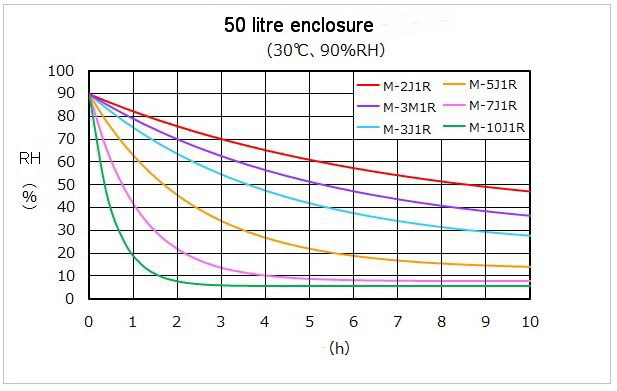 The following curves indicate drying performance under defined conditions. The characteristics of the graphs will vary depending on the material in the container and the degree of air-tightness/leakage. If the container contains absorbent material, the membrane induces release of moisture from the material, which may slow dehumidification inside the container. 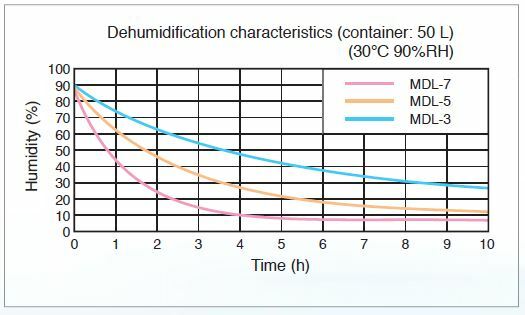 The dehumidifying capacity of the membrane varies according to the absolute water amount inside the container. Changes in the ambient humidity may also affect the performance, and the curves are provided for guidance only. Refer to the user manuals in the documentation section of this site. In addition, please note the following points to help you use Rosahl correctly. If you are in any doubt about the suitability of Rosahl for your application, please contact us. – The device will be effective from -20 to +50C (manufacturer has tested at over 50C for storage to a maximum of 80C). – When unpowered, the membranes do not provide a barrier to moisture from entering the enclosure. – The devices require a power supply of 3V DC with constant current-limiting protection. Some fold-back type PSUs are not suitable. All hiccup mode PSUs are unsuitable. – Unless fully vulcanised, silicone rubber sealants should not be used as they adversely affect membrane performance.